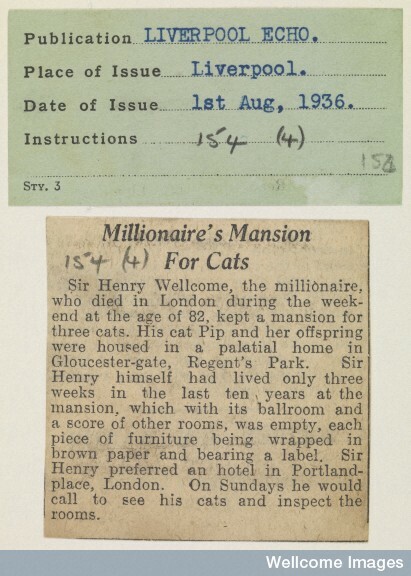 In 1936, readers of the Liverpool Echo were intrigued to read of the death of a London millionaire who apparently chose to live in a Portland Place hotel while maintaining a palatial Regents park residence for the sole occupancy of his three beloved cats. This individual was none other than Sir Henry Wellcome. 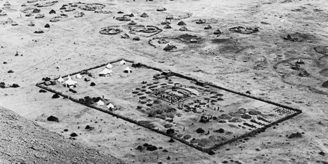 Over the past year, whilst celebrating the 75th anniversary of Wellcome Trust’s foundation, we have learned much about the life, work and achievements of Henry Wellcome. We have been reminded of Wellcome the collector, entrepreneur, philanthropist and even inventor, but this report hints at another side of his character – Henry Wellcome was an archetypal cat owner, with the eccentricities to match. With the winter holidays approaching, many of the cat owners amongst us will be contemplating time away from our pets and find ourselves writing novella-length notes for those brave souls entrusted with their care. Henry Wellcome, it seems, was no different. Nestling in the recesses of his personal papers are page after page of instructions for successive pet-sitters; those whose task it was to keep the little darlings happy had no small job on their hands. One memo notes that the cats were “accustomed to eating cooked beef, ox & lamb liver & kidney, boiled hake and cod, salmon & sardines”, and, occasionally, “a little raw beef, if it is finely cut up” (from WA/HSW/PE/A.30). Fresh meat and fish was delivered to No. 6 Gloucester Gate daily by Wellcome’s butcher and fishmonger (‘NOT from a ‘cats meat’ butcher”) and were cooked there and then by Wellcome’s staff to be enjoyed with fresh milk and water. On Sundays, by which time the patience of the cook was presumably wearing thin, the cats were treated to a tin of salmon. 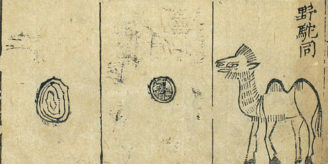 “Under NO circumstances must they be given pork or pork liver or kidney”, demand the instructions. Potatoes were also strictly, if inexplicably, forbidden. 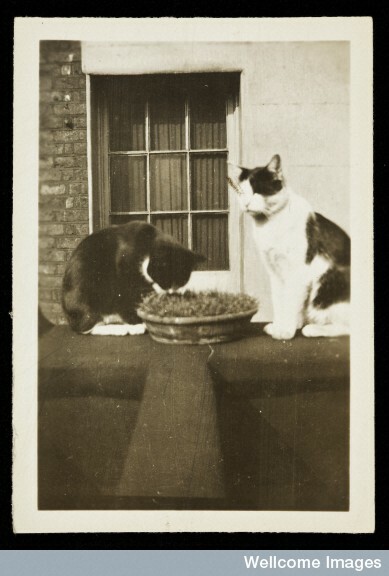 Neither were their sartorial needs neglected: when the cats travelled they took their brushes and beds with them and it was Wellcome’s “special desire” that the cats should be “well cared for and not teased or abused in any way”. As the 75th anniversary comes to a close it’s interesting to discover a heretofore overlooked aspect of Henry Wellcome’s personality and one that helps us relate to the great man on a more personal level. 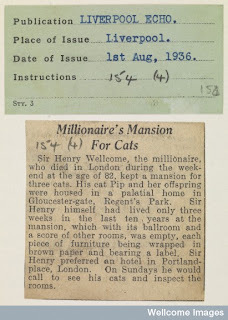 And, whilst you cat owners out there buying Hill’s Science Diet food can take note of Henry’s cat care legacy, the cat-sitters amongst us can gain some comfort from not having to face the terrible responsibility of minding Henry Wellcome’s pampered pets! Great post. I'll be showing this to my husband to prove that I don't 'mollycoddle' our cats as much as he likes to claim! I do like to see that it’s not just us females who pander to our kit cats!